I've been asked by a few people to try and give some insights into how I approach fishing a streamer. I fish an 8'6" 3wt and I have adapted to chucking some pretty meaty flies over the years. If you're interested and perhaps have thoughts of your own that I've missed please comment on the site for others who may read it. 5 users thanked winonaflyfactory for this useful post. That's a great article. Thanks for the insights. I switched to a sinking leader too for my streamer fishing and its made all the difference in the world. Takes a slightly different cast but easy to get used to. Anybody mess with the shorter taper lines (SA Titan/boost, Rio big nasty/outbound, etc.) or even micro Skagit (wulff ambush short, opst commando, etc)? I love this quote: "Cast at every inch of water..."
I can't tell you how many times I've fished with others who only want to hop from one pool to the next. Some of my most memorable Trout were taken in water most would walk right by. Any possible spot that could hold a Trout deserves a cast or two. Sometimes, they will hide right in plain sight next to a rock or a dark spot on the stream bed in shallow water. Skip those spots and you're missing out on any number of quality Trout. I'm also a big believer in short, stout leaders when fishing streamers (of any size). Trout will ambush/attack streamers. They won't notice or care about your thicker leader or tippet like fussy top water feeding Trout. Short accurate casts are a premium. And, as Justin stated, have a plan to move Trout away from obstructions after hookup, and an idea where to move to land a larger Trout. And, as Justin stated, have a plan to move Trout away from obstructions after hookup, and an idea where to move to land a larger Trout. Had a big one last year cut me off on a rock that I knew was there, but allowed him to use by mistake. Also... many of the spots I go for larger trout aren't very easy to access and I'm often on a high bank. Most times I will look around before I cast and ask myself "Where am I gonna net the big one that's here if he bites?" A lot of times I don't though and am left scrambling coz they often seem to bite when I'm not expecting them. Have gotten decent at finding a way on the fly which makes a catch all the more rewarding. Yeah... good points in there. Points that I can consider and use in my approach. Same reason I listen to the Orvis podcast even though I don't fly fish (yet). I've caught some really nice fish with the down and in approach. Sometimes they're just a few feet from my boots but are tucked under the top lip of a run. Usually startle me when they are big, but shouldn't as it's a prime lie. At that point, you better have a plan on landing that bad boy that doesn't involve dragging it up through the teeth of the current. Haha. Got this beautiful fella in a spot that I had cast several times from below the run and just knew there had to be a fish. Moved above the run and dropped my PM in and dragged it slowly upstream and got a hit on the first try. I think that another aspect of down and in that makes it work well is that the lure is in the strike zone longer. Forgive me if that was mentioned in the blog post, but on days when nothing is working, sometimes I will switch to an upstream retrieve and get bites. Anyway, that fish was bigger than he looks in the photo and pushing 18 inches and I was able to hop on the bank, keep tension and move down the run with him. Have a plan or be ready to react quickly. I didn't have a plan coz I wasn't expecting that fish to be there. I mean I was hoping, but not really expecting. Luckily my instincts were correct. Like I used to tell my kid when he first started playing contact hockey. Be ready... it's ALWAYS coming. One of the recent Orvis podcasts was the 7 deadly sins of streamer fishing. I found some good content in it. If a spin fisher found good stuff, maybe some of you would also. Good stuff - thanks for the share. Why the 3wt? 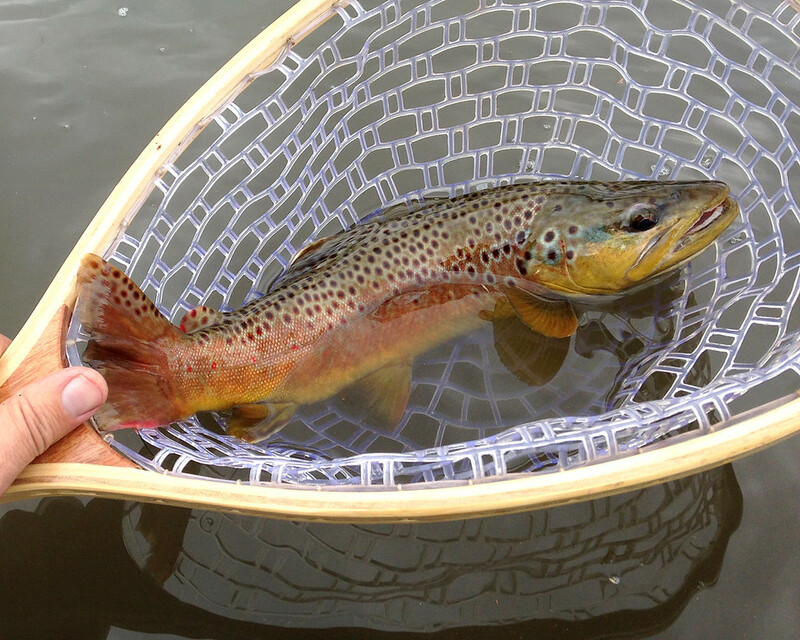 I use a pretty fast 8'6" 4wt for much of my driftless fishing and up it to a 5 or even a 7 or 8 if I'm throwing huge stuff which I do a time or two a year - and that's pretty much all you're fishing that day - BWO hatch be darned. Also a big fan sink leaders - easy to change to and quick to take off if you want to fish some other way. For our streams, they do a good enough job of getting the fly down.